SEATTLE, WASHINGTON, UNITED STATES, October 26, 2018 /EINPresswire.com/ — High Performance Computing (HPC) refers to high speed computation, which may be provided via a supercomputer or via parallel processing techniques such as leveraging clusters of computers to aggregate computing power. HPC is well-suited for applications that require high performance data computation such as certain financial services, simulations, and various R&D initiatives. HPC is part of the overall Next Generation Computing market in which the United States is anticipated to lead through at least 2023. 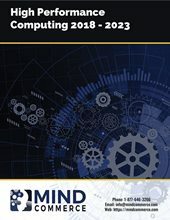 Mind Commerce sees the global HPC market reaching $49.3 billion by 2023. Up to 43% of revenue will be directly attributable to the cloud-based business model via HPC-as-a-Service (HPCaaS), which makes High Performance Computing solutions available to a much wider range of industry verticals and companies. Exascale-level computing will account for less than 2.5% of global HPC market by 2023. The Exascale Computing market is currently driven by demands of a limited number of large corporations and governmental entities that require intensive number crunching for very specific problems. However, exascale-level computing will ultimately become more accessible to smaller businesses via HPCaaS solutions and thereby utilized more extensively. High Performance Computing Market 2018 – 2023 evaluates the HPC market including companies, solutions, use cases, and applications. Analysis includes HPC by organizational size, software and system type, server type and price band, and industry verticals. The report also assesses the market for integration of various artificial intelligence technologies in HPC. It also evaluates the exascale-level HPC market including analysis by component, hardware type, service type, and industry vertical.